The opening of the Institute to Asia starts being developed from a resolution approved by the General Chapter held at Villa Brea in 1995. In it, it was expressed the desire to offer the charism of the Congregation to other areas of the Earth where it was not yet present. We were thinking on the Asian continent. In 1997 the Brothers of the Holy Family of Belly and the Brothers of the Holy Family of Vietnam formed a Federation “Sainte-Famille”. Fruit of the collaboration between both Institutes was the foundation of the Philippines. The first trip of exploration to the Philippines was done by Brothers Lino Da Campo and Carlo Ivaldi in 2000. The city chosen to establish the new Community was Davao-Lasang in the island of Mindanao, the most southern island of the biggest island in the Filipino archipelago. In 2000 the first Community arrived, formed by Brothers Davide Del Barba, Andrés Galindo and two Brothers from Vietnam. In 2001 it was created the “Gabriel Taborin Technical School”, a school of vocational training, with higher studies to serve the youth of the area. In 2002 the Federation between the two Congregations was dissolved, and the Community was only formed by the Brothers of the Holy Family of Belley. Some steps were taken in the strengthening of the vocation promotion and it was created the Nazareth Centre for the formation of the candidates to Brothers of the Holy Family. An important moment was the inauguration in October 2008 of a new building of the School with better premises for the education. In 2006, a house in Davao is rented and in 2009 it is inaugurated the Formation House of Buhaim to welcome a group of young men in formation and the formation of the young Brothers. The foundation of Indonesia was boosted by the General Council. On 25 December 2009, Brothers Juan Andrés Martos and Andrés Galindo did the first trip of exploration in view of a possible foundation of a Community in the island of Flores. Beginning of March 2011, Brothers Andrés Galindo and Santiago Barrionuevo reached Maumere and they stayed in the Community of the Divine Word of the Seminary of St Paul in Ledalero. Soon, the vocation promotion was started with the aim of beginning the new course with some formees. In August the tasks of formation started in a rented house: “Biara Nazaret”. In February 2012, the house acquires an international character, since a group of young men from Timor-Leste joined the Indonesian formees. 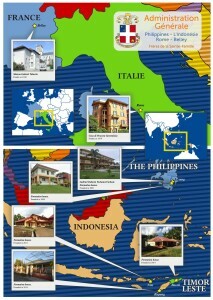 Besides in 2014 two formees from the Philippines join the formation house. 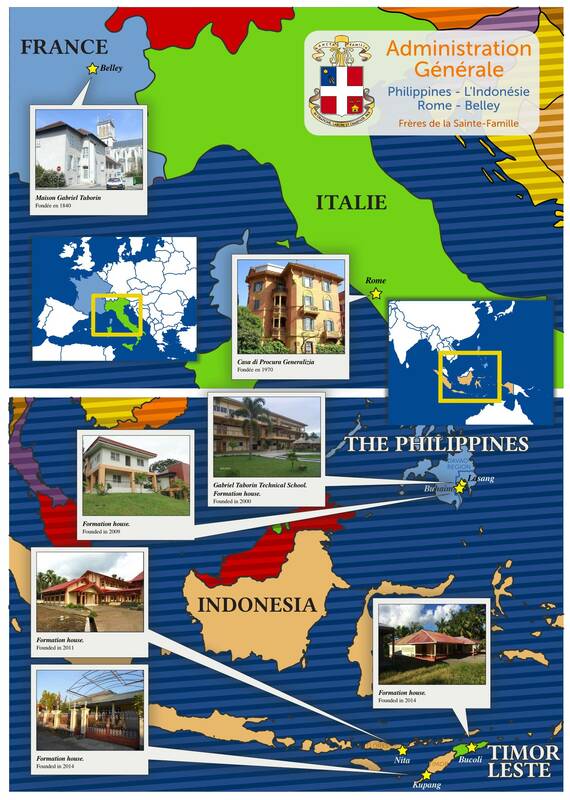 In July 2013, the Community is moved to the new Formation House in Nitakloang; 11 young start the Novitiate, inaugurating thus the Novitiate of the Brothers of the Holy Family in Indonesia. The Brothers in Indonesia paid some visits to Timor-Leste. In November 2013 they reach Dili Brothers Nazaire Bakouan and Albano Schroeder, destined to the new foundation in Timor-Leste. After some explorations, Bishop Basilio Do Nascimento, the Bishop of Baucau, welcomes us in his diocese and assigns the Brothers to the locality of Bucoli. The Communities of the Philippines, Indonesia and Timor-Leste depends on the General Administration. The vocation promotion, the formation of the candidates and the service to the evangelization are the priorities of the Congregation in these countries. The School of Lasang offers the service of the Christian education to more than 500 young people of the area. There is a strong commitment with the local Church through catechesis of children and the liturgical animation in the nearby parishes. * Davao-Lasang Founded in 2000 “Gabriel Taborin Technical School”. Higher Education and pastoral activities. Formation house. * Buhaim Founded in 2009 Formation house. Pastoral activities. * Nita Founded in 2011 Formation house. Pastoral activities. * Kupang Founded in 2014 Formation house. Pastoral activities. * Bucoli Founded in 2014 “Centre for education of adults”. Formation house. Pastoral activities.